Where did December go?! I feel like my travels are going by so quickly. Sometimes it feels like I've been gone for ages and other days it feels like I just left home. This is going to be a shorter recap, since most of you know that I lived on a catamaran for a month. But what else was I up to in December? Cairns - While I wasn't a big fan of the actual city itself (it lacked character and charm), I loved all the various things you could do in Cairns. From skydiving to bungee jumping to scuba diving to rainforest tours, there was never a lack of things to see or explore. Of course, that also made Cairns expensive, but how often are you in a city that borders the largest reef in the world and a World Heritage rainforest? I can't complain about any of the beds I slept in. I stayed at Cool Bananas Hostel in Agnes Water, which is the hostel I'm now working at, and I got to spend 20 nights on a boat surrounded by water! In Cairns, I stayed at Dreamtime Travelers Rest, a laidback hostel with plenty of space and two kitchens. It cost $26AUD / $19USD a night; prices were high because I stayed there over the holidays. There was a large common area and a big drop down screen that was perfect for playing movies. I stayed in a 7-bed mixed dorm with a shower and toilet. The rooms were clean and even though the a/c cost $1 for three hours, it was well worth it. Drinking wine as the sun set over 1770 - I took an amazing tour at the beginning of December in Agnes Water and 1770 before I left for my sailing trip. It was led by Georgia, a local resident, and she took us to a kangaroo sanctuary, through a forest path, to the marina to feed fish, and finally to the spot where Captain Cook discovered Aus in 1770. We watched the sun go down, sipped wine, and ate crackers with cheese. I loved this moment. 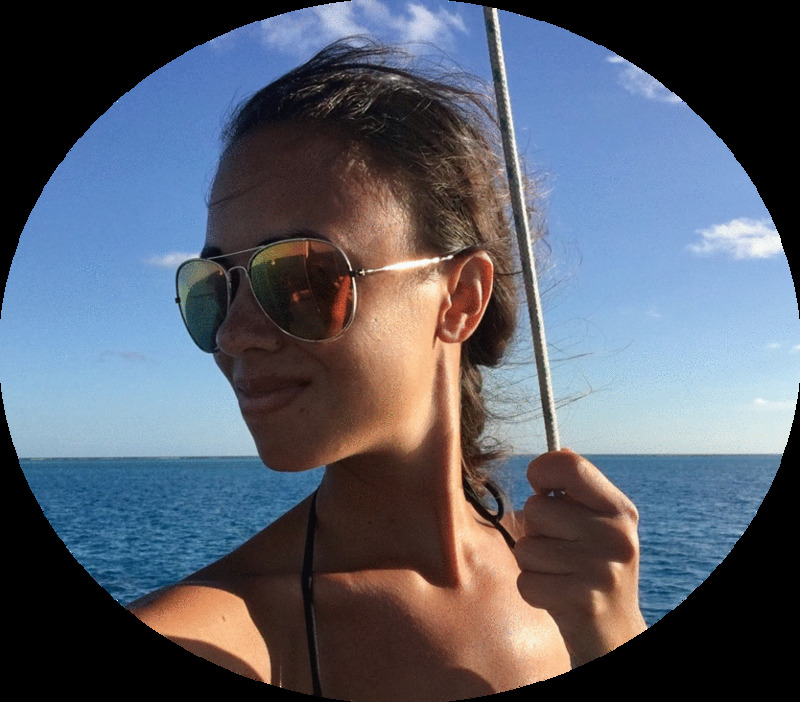 Sailing to Fraser Island and Lady Musgrave Island - There were so many highlights from my sailing trip, all beautifully recapped in this post! Having time to myself in Cairns - Even though I did spend 8 nights in Cairns in December, most of those days (to be honest) were spent lounging around and not doing anything at all. After spending three weeks with four strangers on a boat, I needed some time to myself. I went grocery shopping, read, wrote in my journal, and caught up on sleep. As a result, I crammed a ton of things in my last four days in Cairns, which were in January. So I've got lots of updates to share on rainforest trekking, waterfall chasing, and scuba diving! Exploring the rainforest at night - I booked a rainforest tour that was led by a biologist. The tropical rainforest in Cairns is a World Heritage site; it's a pretty unique area! Part of the tour took place at night. We walked along the rainforest and the guide shined a flashlight on all the animals that come out at night - possums, owls, tree kangaroos, muskrats, and more! It was a really cool way to experience the rainforest and I learned a lot, particularly about rainforest conservation and how many of these animals are endangered or extinct. Missing home during the holidays - Being away from home during my birthday and Christmas was a bit surreal. I wanted to spend Christmas in a bigger city so I wouldn't feel alone, but it turns out Australians celebrate Christmas Eve more so than Christmas Day. Since I was on a bus for most of Christmas Eve, Christmas Day was a bit of a dud. McDonald's was the only place that was open (the line was out the door) and the hostel wasn't doing anything for Christmas, so it was a quiet, uneventful day. It was the first time I wished for snow, hot chocolate, and big, comfy sweaters! Being disconnected from the world - While I was on Peter's boat, I had no cell phone service for 20 days. It was the strangest thing to not to be able to check the news, my social media accounts, look at my emails, or contact anyone. While it was a challenge, it was a good one. By day five, I was totally used to being without my phone and realized I didn't need to be on it all the time. It was essentially a cell phone detox! Those 24 hour bus rides... - Aus is just such a large country! It was a 24 hour journey by bus from Bundaberg to Cairns. I've become a pro at squeezing myself into a little ball to fall asleep in two seats, provided no one's sitting next to me! I did compare prices to flights, but Greyhound always ended up being cheaper because I had a 50% off discount throughout December as a birthday promo. I have also learned NOT to sit in the back by the bathroom. Waaayy too smelly for me. All costs are in US dollars! By living and working on Peter's boat for three weeks, I saved $400 that I would have spent on accommodation and $150 that I would have spent on food during that time. My accommodation costs were way lower than they were the month before. I spent more on activities because of a rainforest tour that I paid for in Cairns on December 30, but otherwise I'm really happy with my expenses this month and I'm going to keep looking for work for accommodation opportunities. They definitely make a difference! The only shower on Peter's boat -- outdoors!! Seeing as how I only posted once in December, it would have to be this post. A 4am sunrise before sailing for the day. But I'm halfway through the second Game of Thrones book, A Clash of Kings. It's been keeping me occupied with a cool 800 pages. I have so many ideas for blog posts in my head, I just need the time to write them down! I want to share my experiences in Cairns, but I also want to share tips on how to work for accommodation and how to save money for travel. I'll be working on some of those posts while I'm in Agnes Water. I'm back at Cool Bananas, that awesome, family-style hostel I really loved in Agnes Water. I'm going to start job searching ASAP. It's a tiny town, so I'm not sure what I'll find, but it would be nice to work in a quaint café. My online grad school classes (my last semester, HOORAY!) start on January 9, so I'll be staying put in Agnes Water for awhile and I'm happy with that. If there's a topic you'd like me to write about on my blog or a travel question you'd like advice on, leave me a comment / message me!